Delivery of "C57 Steam Locomotive" and "Straight Track 440mm" will start soon! in April in Japan, also start delivery for overseas soon after. will be started delivery in May in Japan, also will start delivery for overseas soon after. Please follow on Facebook:Delivery of "C57 Steam Locomotive" and "Straight Track 440mm" will start soon! Delivery of "C57 Steam Locomotive" series will start on 28/March! on 28/March in Japan, also start delivery for overseas soon after. *Its symbolized deflectors are made by sharp etching parts and that makes whole appearance of C57 extremely realistic even 1/220 scale! Let's go to retail shop nearby you for making purchase! Please follow on Facebook:Delivery of "C57 Steam Locomotive" series will start on 28/March! 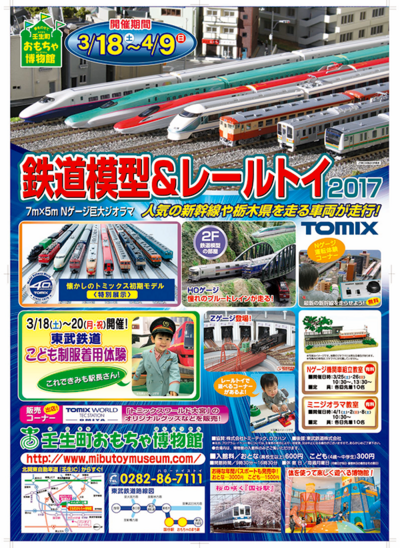 Rokuhan will attend "Model Train and Toy Train Exhibition 2017"! We Rokuhan will attend "Model Train and Toy Train Exhibition 2017". "This season" is coming again! Rokuhan official booth always will offer great "Z-Gauge" experience, not only enthusiasts but also family groups! "C57 Steam locomotive" series will be coming! And "Mibu Toy Museum" has official Rokuhan shop! Don't miss it! Please follow on Facebook: Rokuhan will attend "Model Train and Toy Train Exhibition 2017"! Tips for improving detail of Wood Engine House! We Rokuhan already have released "Wood Engine House" series as Rokuhan structures and would like to get an opportunity to introduce tips for improving detail of "Wood Engine House"! This time key item is "LED light". Imagine if somebody who is one of your hobby friends say, "I'm finally done installing LED lights on my models!" Maybe you will assume that he is done installing LED lights for head/tail/room light on something his model trains. But, Rokuhan is beyond your assuming! We Rokuhan already have been releasing LED lights set as accessory for installing on Rokuhan structures series. Let's see how to install LED lights on your own Rokuhan structures taking example of "Wood Engine House" series to improve detail more real! *2 colors line-up! Choose your favorite color! *Includes consumer apply labels each! This LED color is "Orange", that is right for old-style building such as Japanese traditional shops and "Wood Engine House" are! This terminal has five sockets for LED lights cables and own socket for connecting with RC03 Train Controller (sold separately) or C002 Accessory Switch (sold separately) to switch on-off. There are two recommended way of installation of LED lights . *This instruction is based on "Pattern1", let's take a look at each step below! 1. Set LED in place first, then hook cable at every boss wall-side. 2. Insert socket from LED set (male) at socket from "Accessory Power Terminal"(female), then insert socket from "Accessory Power Terminal"(male) at socket from "RC03 Train Controller" (female). To hide each cables(from LED light, controller, terminal) is very effective way to be more real, especially on diorama bench-works. This basic technique is just wiring at back side. Not so much complicated, but so much important for realism! Now you already know this tip, let's hide cable well to be more real! Have you ever thought about installing LED lights on structure component? This is good opportunity to install LED light! No doubt that Rokuhan train models are all sophisticated and precise, but let's enhance your own Rokuhan z scale world be more real, not just only trains, but also structures on your diorama bench-works! Please follow on Facebook:Tips for improving detail of Wood Engine House! Tips for loading container on freight car! This time's theme is "Container" and "freight car". We Rokuhan already have released freight car "Koki 106" for carrying containers and would like to have a time to let us introduce some tips and background to be more fun and realistic your Rokuhan Z scale world! *All Rokuhan container series (sold separately) are assembled OK! All Rokuhan "Koki 106" series has red light reflector as consumer apply parts! Just insert light reflector in place at rear side! Not needed any special works! Before the period of dramatic economic growth in Japan, freight cars were main transportation way to carry many supplies by just one-time. But, situation was changed; thanks to high-demand of construction for highways because of economic growth at that period of Japan, people shifted to use trucks as main transportation way to carry supplies instead of freight cars. It seems trucks were monopoly of transportation way in Japan. But, recent years, they said that freight cars are eco-friendly - releases less gas emission than tracks, now freight cars got spotlight again. Rokuhan modeled up one, "Koki 106" is also one of freight cars got spotlight and is main factor of pushing sensational waves that its eco-friendly side. Do you know how do containers be loaded on freight cars in actual scene? In actual scene of loading containers on freight cars, it seems containers just be loaded on freight cars as much as possible. But, actually no, there are important rules; according to safety point of view, weight of containers each and its total amount, its size, and its mounting position, are necessary factor for safe delivery, and avoiding critical accidents when running. Even there is enough space for loading, sometimes containers don't be loaded if condition of safe may not be met. Now, let's see how to load containers using "Koki 106" and Rokuhan container series, and please try it with your "Koki 106" and Rokuhan container series to be same as actual loading containers scene on your Z-scale world to enhance realism! 12ft containers are most common size container in Japanese logistics scene, JRF has at least 50,000 pcs 12ft containers and carry anywhere nationwide. Maximum loading quantity on Koki 106 is 5 containers. 20ft containers are world-standard size container. Maximum loading quantity on Koki 106 is 3 containers. 30ft containers are one of the biggest size container in Japanese logistics scene. Maximum loading quantity on Koki 106 is 2 containers. 40ft containers are world-standard size container as sea transportation. Its size is quite big, so maximum loading quantity on Koki 106 is just 1 container. How can containers be loaded if each containers are different size? Let's see a picture below. It's possible to load a few size containers by one "Koki 106". Of course, they are following rules to be safe in actual scene as you already know. Let's load containers on your Koki 106 based on these tips! Have you ever thought about loading containers on freight cars and knew that they are loaded based on rules for safety before read this time article? Now, you already know and could try to arrange with your Koki 106 and Rokuhan containers! You could make formations based on this tips with your needs and create busy-ness on your Koki 106, create a very long line of Koki 106 with fully loaded containers, or not so much containers loaded but it's still recognizable that line of regularity based on its safety! Why don't you load containers on Koki 106 to be same as real one to feel Japanese logistics scene with using Rokuhan products? We Rokuhan will keep going on offering tips for your Z-scale more fun and hopefully stimulate your curiosity forever! Please follow on Facebook:Tips for loading container on freight car! Delivery of T027-1 "C57 Steam Locomotive" starts on 24/Feb and IMPORTANT ANNOUNCEMENT FOR T027-2 and T027-3! We Rokuhan start delivery following products on 24/February in Japan, then will start delivery for overseas. It was very long postponement and delayed to release T027-1 "C57 Steam Locomotive #19 first version standard shape type (Nitsu shed)", but finally we Rokuhan now can announce its release date officially. Hopefully this announcement is good news for all dealers, distributors, retailers, and Rokuhan enthusiasts! And again, thank you so much for understanding situation! T027-2 "JNR C57 Steam locomotive #111 type (Montetsu smoke deflectors)"
T027-3 "JNR C57 Steam locomotive #1 (Royal train)"
We Rokuhan already have announced that it starts delivery in February. However, we now decide to postpone its delivery date due to various circumstances in our production process side. As present situation of new delivery date, will be in middle of March. And, we will announce exact date as soon as possible. We deeply apologize for this result of postponement and decision same as situation of T027-1 "C57 Steam Locomotive #19 First Version Standard Shape Type (Nitsu Shed). We Rokuhan all staffs, will keep working harder to be best Z-gauge supplier for all dealers, distributors, retailers, and Rokuhan enthusiasts worldwidely. Hopefully you understand this situation, and please keep your interest in Rokuhan products continue and that is our big goal! Please follow on Facebook:Delivery of T027-1 "C57 Steam Locomotive" starts on 24/Feb and IMPORTANT ANNOUNCEMENT FOR T027-2 and T027-3! Delivery of Wood Engine House series start on 26/January! Please follow on Facebook:Delivery of Wood Engine House series start on 26/January! As for T027-1 "C57 Steam Locomotive #19 First Version Standard Shape Type (Nitsu Shed)", we Rokuhan already have announced that it starts delivery in January. However, we now decide to postpone its delivery date due to various circumstances in our production process side. As present situation of new delivery date, will be end of February. But, we will announce exact date as soon as possible. We deeply apologize for this postponement and decision.